The Main Street Group Foundation recently awarded Worcester Children’s Chorus a $500 grant to support its after-school choral program. The programming will enrich the lives of 105 children, ages 8 to 18, from Worcester County, by providing them with a positive outlet to pursue their musical interests, develop their abilities in choral singing, and contribute to their local arts community. As part of its 2019 programming, the Worcester Children’s Chorus will offer financial aid to singers who might otherwise be unable to participate in our choir. Singers will be eligible for financial assistance if they qualify to receive free or reduced lunch at school. The Worcester Children’s Chorus anticipates that approximately 20% of our singers will require tuition scholarships to enable their participation in our 2019 program. In 2019, the Worcester Children’s Chorus will continue providing singers with a safe haven that counteracts the impact of adversity in its service area through a variety of protective factors. The Worcester Children’s Chorus’ ensembles, conducted by Dr. Mindell and Mr. Montgomery, will provide our young singers with a friendly environment to develop their musical interests and connect with peers engaged in healthy social activities. Founded in 2008, the Worcester Children’s Chorus is a recognized 501(c)(3) non-profit organization with a mission of enriching the lives of children throughout Worcester County by providing a quality musical experience through training in choral singing. Our vision is to give children the tools to be independent musicians and creative individuals who can express themselves in beautiful ways and be active participants in Worcester County’s vibrant arts community. We believe that when children participate in a choir, they gain invaluable musical training, confidence, and a sense of belonging. 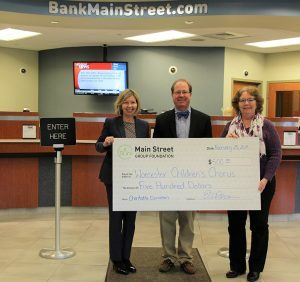 Main Street Group Foundation was created to further community development in the cities and towns served by Main Street Bank and to support community organizations that contribute to the quality of life in the Bank’s market. Main Street Bank was formed as a result of the merger of Marlborough Savings Bank and North Middlesex Savings Bank in 2017. A strong supporter of the communities, Main Street Bank is challenging the ordinary banking experience. To learn more about Main Street Bank, visit www.bankmainstreet.com.